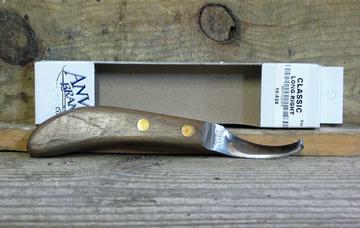 One of our most popular horse knives. 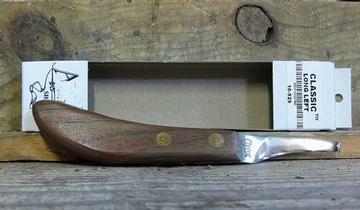 The Classic hoof knife is sold around the world, 100% MADE in the USA. Copied by others, there is only one hoof knife that comes in the Anvil Brand farrier supplies blue and white box. A popular farrier tool, The Classic Long horse knife has a longer handle than the Regular - for good, safe leverage. The Classic Long handle is 5 5/8" long, tapering from 1.5" to 1" wide near the blade. The drop blade has approx 2 1/2"exposure from the wood handle and is about 3/8" wide and sharpened at the bottom of the drop. 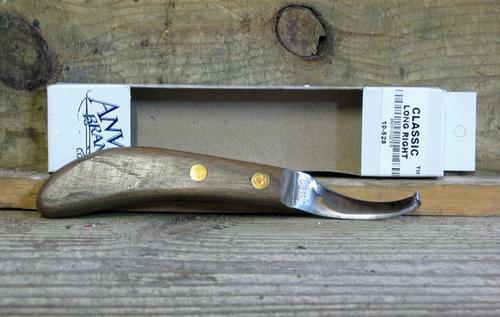 High Quality steel from the USA makes this hoof knife easy to sharpen. We heat treat this to a consistent Rocklwell 'C' hardness. This is the Highest quality horse knife on the US market.